Dog Days has one sole mission: to help dogs. No matter where they are, how far we have to travel to get them, how much time it takes to rehabilitate them or how much care to heal them, we will help all dogs. 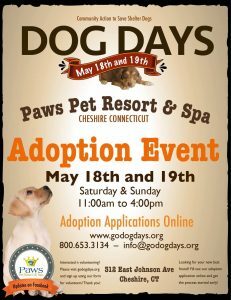 Each year we plan community adoption events to help find homes for the dogs in shelters around the state of Connecticut and beyond. You can help by volunteering or adopting! Training community volunteers of any age and in any capacity: to help at adoption events, to learn how to rescue or foster – interested? Click here to read more..
We sponsor,rescue and rehabilitate dogs through our dogs in foster called The Red Dog Project. Some dogs need more time and patience to thrive and so do some people..click here to read more.. In times of natural disaster municipalities need temporary housing for pets coming into emergency shelters – with space for hundreds of animals our trailers with crates and kennels are needed and we go when called! Ready to save a life? PLEASE APPLY NOW!